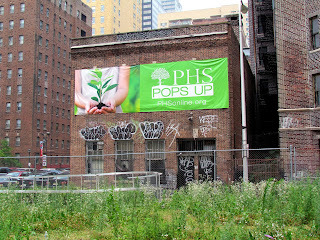 Last Friday, the Pennsylvania Horticultural Society (PHS) launched its second pop up garden in an empty lot at 19th & Walnut, just off the northwest corner of Rittenhouse Square. 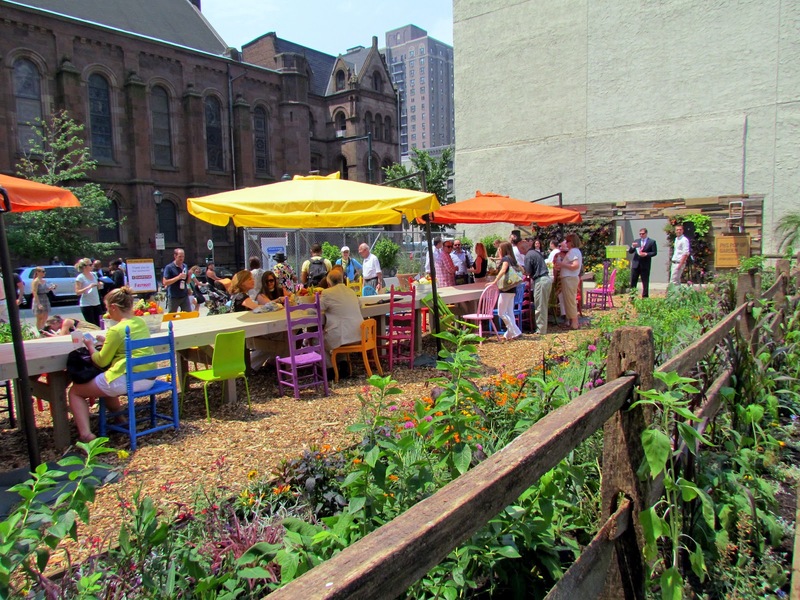 We're proponents of transforming any unused lots into green space, but this one struck a special chord. 22nd & Philly was conceived while we lived at 22nd and Walnut, and for three years we would shake our heads as we walked past this multi-million dollar piece of city real estate that was left to sit as a barren wasteland. What a shame! Bradd's vision was to turn it into a Citizens Bank Park replica for whiffle ball, but a community garden is also a nice idea. So it was with pleasure that I braved the oppressive heat last Friday to attend the grand opening of the garden. 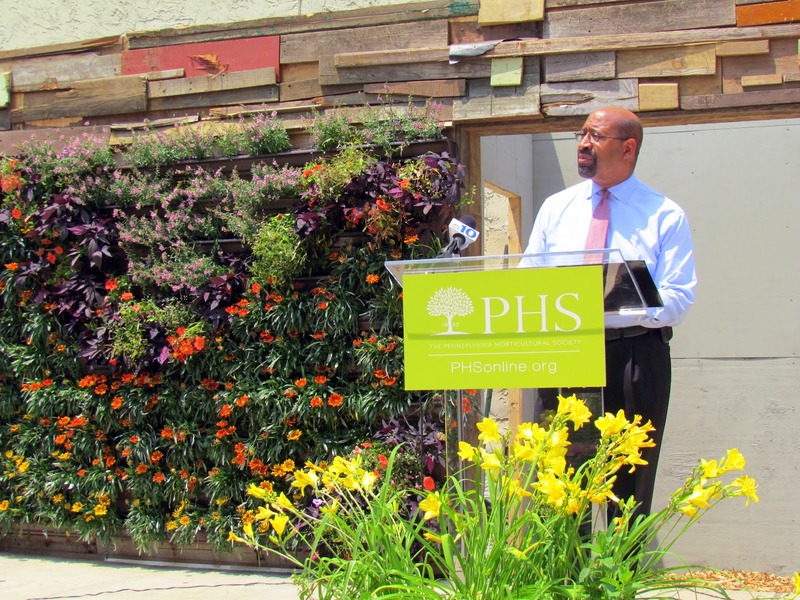 Mayor Nutter gave a quick speech emphasizing the importance of these gardens to bring fresh food to thousands of Philadelphians who don't have regular access to it. It is also part of a critical effort to clean up our city's plethora of abandoned and empty lots with green space for communities to enjoy. According to Nutter, Philadelphia's goal is to be the #1 green city in America. PHS's architects, the Mural Arts Program, sponsor Chipotle, and other involved parties did a great job. Props to Tim Abell, President of Firstrust Bank, also a sponsor, for the quote of the day: "Even though it's hot, how cool is this?!" On each end of the lot is a lovely and intricate, large wooden art structure reused from the City Harvest exhibit at the 2012 Flower Show. 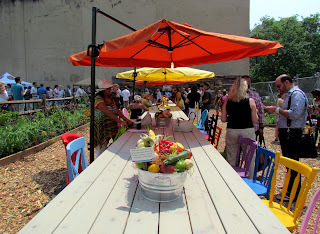 In the middle is a beautiful, 60-person communal table complete with umbrellas and multi-colored wooden chairs painted by Mural Arts Program students. 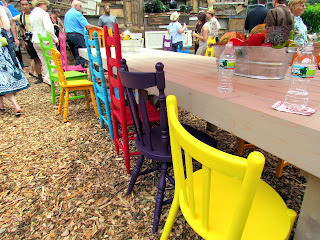 During open hours, the table is there for anyone in the community to use for a gathering place, a picnic lunch or an al fresco dinner. You can bring in your own food, PHS just asks that you take out whatever you bring in. I asked a few people if you can bring a bottle of wine and no one was really sure, so just be respectful if you do. Throughout the summer, the pop up garden will play host to gardening lectures, flower markets on Tuesdays, children's activities and other group events. More artwork including murals and sculptures will appear on the property as well. Regular garden hours are Tuesdays through Fridays from 11am to 2pm; Thursday evenings from 5pm to 7pm; and the second Saturday of each month from 9am to 1pm. Go check it out! 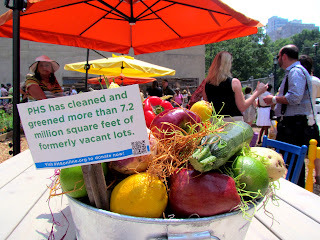 More information here, including a way to upload your photos of the garden so they become part of a giant tablecloth. 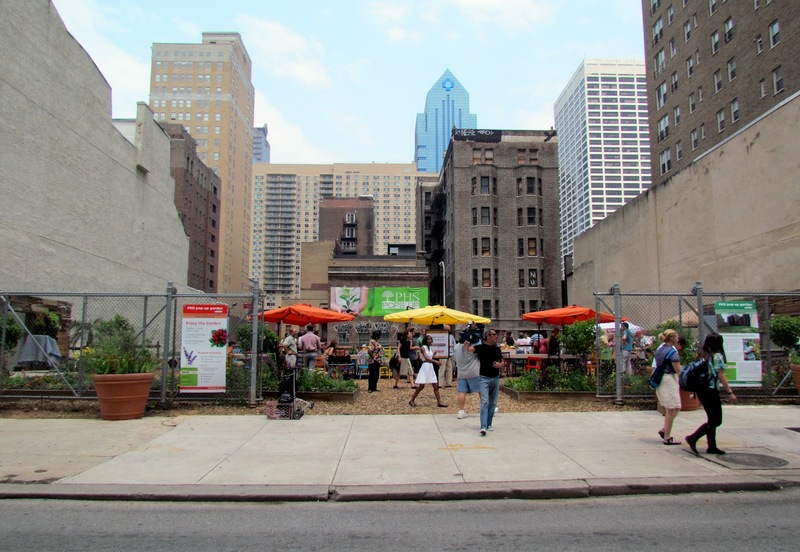 Also read this interview Bradd did with the creator of Philly Food Shed, who is working with local restaurants and community groups to turn more empty lots into urban gardens. Leaving aside the fact that Nutter is an idiot, his plans for a "green" city obviously don't include people. He's about to triple property taxes for residents, and the Center City Business District (the "vision" of businesses to keep CC in shape) now must be paid by the people who live in CC. With all the tax hikes and the NOTHING we get for it, pop up parks will turn into pop up housing for those of us who won't be able to afford to continue owning our homes in this "wonderful" burg.